A surprise cameo by Channing Tatum certainly breaks up that monotony. 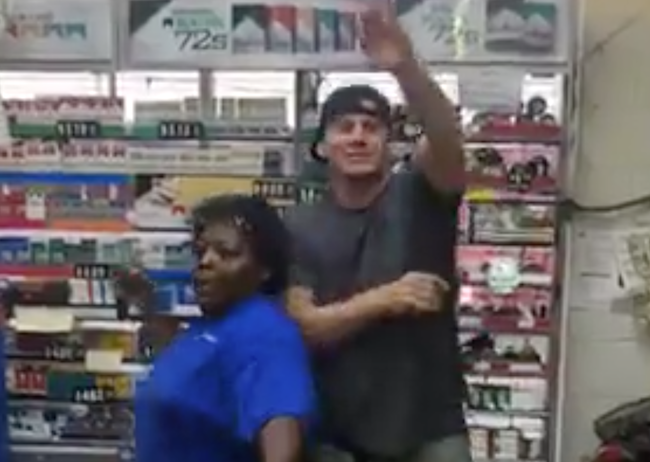 One lucky employee at a Sunoco gas station in North Carolina was treated to an impromptu Magic Mike dance routine by the actor after he popped in to grab an iced coffee and some Reese’s Peanut Butter Cups. Though he regrettably keeps his shirt on, Tatum nonetheless adds a bit of friskiness to Beatrice’s day, twerking through the aisles and giving her a Logan Lucky cap to help promote his new Steven Soderbergh-directed film. After cranking the music up, Beatrice busts a few moves of her own, proving she can shake it with the best of ’em. Why would someone post a video of Channing Tatum where you barely get a clear shot of his face much less anything below his shoulders? What is the problem with whoever was handling the camera? That was totally crap. Is he supposed to be good looking? OMG. Is that a Nazi salute he’s giving? Very troubling. Great video. It’s really amazing how makeup and lighting can transform someone into a whole different person. I don’t think I would have even recognized him, he looks so ordinary. got a little belly on him in between movies I see. What a nice guy.